Bourne is back and ready to kill the guys that tried to kill him. For good. The Bourne Ultimatum picks up right where Supremacy left off, with Bourne in Moscow still trying to figure out why he's so good at killing people. That's about it. There is really absolutely nothing new about this installment in the Bourne series whatsoever except the fact that all truth is revealed by the end of the film. It's more of the same, worldwide cat and mouse game and Bourne beating (A LOT of) people up and then running away on various vehicles or on foot. Rest assured, I am NOT complaining about this by any means! This is one intelligent action-packed spy thriller and not just a mindless summer action flick. I was on the edge of my seat the entire film wondering if Bourne and his partner in crime Nicky Parsons (Julia Stiles) were going to make it to their next location. 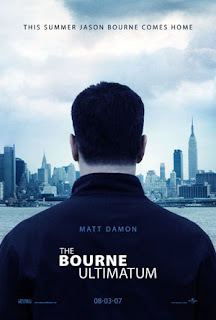 The reason they didn't change anything about the Bourne series is because they paid attention to the old phrase "if it ain't broke, don't fix it." and that's refreshing to see in Hollywood now. The producers/writers/directors knew what worked in the previous two films and used those same elements to make Ultimatum a thrill ride worth seeing. However, there were two problems I had with all of this, first off is the "shaky cam" from Supremacy is back and more motion-sickness inducing than ever which really bothered me at some points in the film. Second, everyone seemed a little TOO eager to act. Everyone overacted to some small event at some-point in the film, luckily it only happened to every character once instead of everybody all the time. While not perfect, The Bourne Ultimatum is definetly a summer blockbuster that shouldn't be lost among the Rush Hours and Transformers and should especially be checked out if you were a fan of the first two or like a good spy-thriller with some crazy action thrown into the mix.